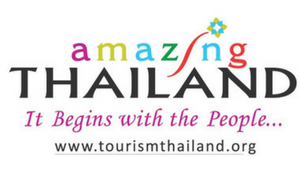 About the fact that planning a trip to Thailand, it is very important to take care of yourself in advance and buy insurance, we say endlessly. However, not all heed the wise advice and often (oh, how often!) 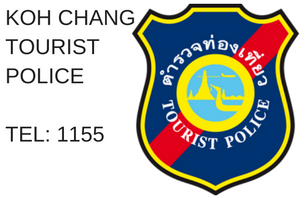 we are faced with diseases of tourists, which you have to treat yourself during the holidays. On the eve of the season we share very important information, which is a must-read! And it is even more useful to print and take with you a sheet of medicines from Thailand. What medicines to take with you to Thailand and which ones to buy on the spot? Colds and Chills. The main danger lies in the air conditioners. Going from hot temperatures in the day to icy cold in your room is not a good idea. Besides, it is extremely unpleasant to get cold here, and the disease tends to drag on indefinitely. First of all we go to the nearest fruit and vegetable stall and buy lime with ginger. Further, at 7 -eleven (good, supermarkets everywhere), there is everything that you might need: paracetamol, cough drops, cough syrup, etc., etc. In the same 7/11 pills are sold Decolgen, they are recommended to drink at signs of a cold, the scheme is described on the package. We highly recommend drinking water, more precisely, as much water as possible. And, of course, hot infusion with ginger and lemon. Scooter accidents. Drops from bikes, scratches, abrasions and bruises: all you need is to thoroughly clean the wound and treat it. For washing, we use alcohol (sold everywhere, with a blue tint), for processing – a weak solution of iodine (local brands – Iodine or Betadine). Note that iodine is produced here in low concentration and is very easily washed off with plain water. Plasters, bandages and all related surgical materials are bought in 7-eleven or in pharmacies. If the “battle wounds” are serious, it is necessary to take antibiotics in order not to get an infection. 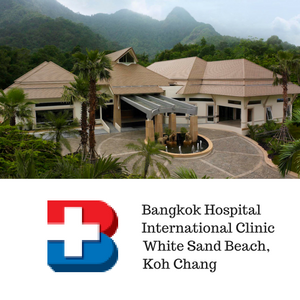 The climate on Koh Chang more than contributes to the immediate spread of infection. Food poisoning. This is also a common ailment for tourists in Southeast Asia. On the island, you can find activated carbon, and in each pharmacy you will be given a set of “first aid” – because unprepared stomachs often suffer from new products in the diet. In order not to get sick in the most long-awaited vacation days, we recommend eating spicy food – pepper, as you know, disinfects well. Sold at Koh Chang pharmacies and digestion pills in case you didn’t calculate your strengths. Motion sickness: Go to any pharmacy and ask for pills from it (sea sickness) – they cost 10-20 THB, take an hour before departure to the sea and feel good the rest of the day. Eyes and ears problems also often occur. Dust, sand and wind when riding a bike or sea and chlorinated water of the pool greatly injure your eyes. If you feel that something is wrong, we recommend antibiotic eye drops. Water enters the ear while swimming, and if you sleep under an air conditioner, then in the morning the sensations will not be pleasant. And in this case, you will also find ear drops in any pharmacy. All these medications will help you with mild symptoms of the disease. Be sure to bring a first-aid kit with the most necessary and familiar to you drugs. 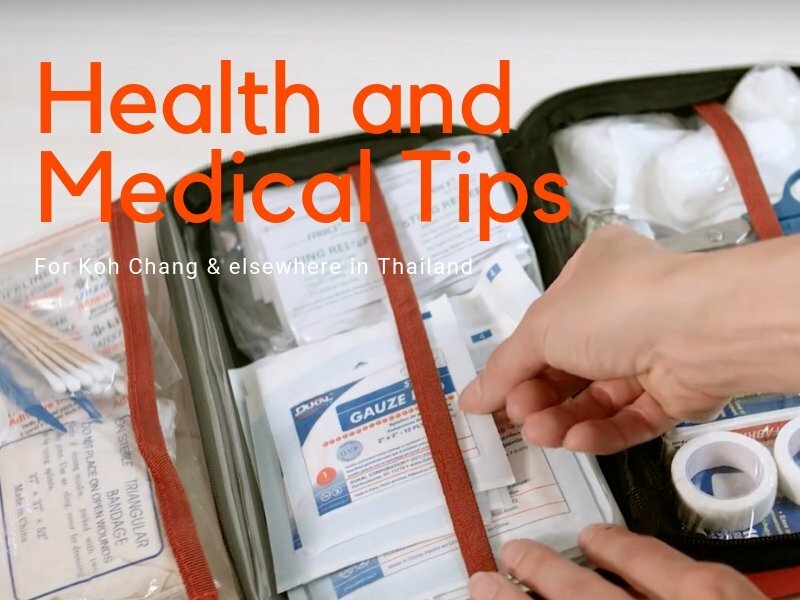 Here is a small list of medicines used for common ailments tourists might get in Thailand . Antipyretic: Paracetomol, Ibuprofen, Gofen (light analogue of paracetamol, helps relieve headaches). Runny nose : Nasol, Tetryzoline Hydrochoride. Cough : Procaterol (asthma and choking), Salbutero / Proventil (ventolin), Para + Orphen (muscle relaxant). Ear infections : SM Oto, Archifen. Eye Inflammation : Tobramycin, OPSAR. Food poisoning : Potassium Permanganate (potassium permanganate), DELTACARBON (activated charcoal), Erfuzide (intestinal antibiotic). Diarrhea : Loperamide (should not be taken if poisoned), Disento. Improved digestion : Combizym (analog mezyme). Allergy : Cetihis, Chlorpeniramine, Telfast. Burns, wounds : Dexpantenol, Becolim 100, Banocin. Painkillers : Ibuprofen, Drotaverin (no-spa), Toverine, Buscopan, Postan 500 (muscle / toothache). Bruises, strains, bruises : Neotica Balm. Migraine : Imigran. Antifungal : Clotrimazole, Canasone. High blood pressure : Cardura.